Yesterday, I re-posted a link on the Teacher Tom Facebook page to yet another study about the negative consequences of hitting children -- what some folks call spanking. Whenever the subject comes up, I'm always shocked, and then depressed, by the fact that there are so many people out there who still insist upon their right, even responsibility, to hit their kids. Some even seem proud of it. Those of you who have been reading here for any time know that I don't shy away from debate, but this is one of those issues that preemptively exhausts me, like arguing evolution with people who simply don't "believe in it." It's getting harder and harder for me to summon up the strength to keep debating things that have been settled science my entire life. I remember my mom, 40+ years ago, telling me about research that linked spanking to a wide array of negative consequences. The evidence has only gotten stronger since then. This isn't an isolated study - this is just one of hundreds of studies which show the negative outcomes that are associated with corporal punishment. The research is clear and well understood: corporal punishment has overwhelmingly negative effects on children's development, and there is now almost total unanimity amongst scholars and child development experts that the effects of CP are undesirable at least and extremely harmful (sometimes fatal) at worst. I'm also not buying the necessity for children to learn obedience, let alone via being hit. In fact, I've found that obedient people are dangers to both themselves and others. I find it bizarre that it is illegal in our country to hit another person, except if that person is a child and you call it spanking. The thought of a big strong adult hitting a weaker child sickens me. There are lots of things that work that I will never try. If I disagree with you, shouting you down works, but wouldn't it be better if I engaged you in a reasonable debate? If I need money, stealing works, but wouldn't it be better if I worked to earn a higher income? If you're standing in my way, pushing you works, but wouldn't it be better to politely ask you to allow me to pass? Indeed, spanking may "work," but there are better ways, with far fewer negative consequences. They just take more effort. But you know, none of this even comes into consideration when forming my own opinion about spanking. These are all rationales fashioned to persuade other people that spanking must stop, but for me it comes down to simple morality. I don't hit people. I don't hit people even when I'm right. I don't hit people when I'm angry. I don't hit people when they won't do what I want them to do. I don't hit other people because hitting is immoral. And it doesn't soften me to call it "spanking." To see how an effective spanking ban can work you only have to look at Sweden. They banned all corporal punishment in 1979 (the first country to do so - 31 others countries have now also banned all CP). Sweden wisely did not criminalise corporal punishment; instead parents who use CP are offered help with learning more effective methods. Naturally, physical abuse and assault remain crimes, but smacking per se does not result in parent's being criminalised. As a result children in Sweden experience some of the lowest rates of physical abuse in the world, and also have excellent outcomes on a wide range of developmental and societal measures. Support for CP has fallen to single digit levels, and few children are ever subjected to it. We should follow in Sweden's footsteps. But sooner or later the rocks always fall. Or at least I assume they do because of what I know about the world: perfection will not be abided. Something always happens to even the most wonderfully balanced of systems, and when rocks fall, especially big rocks balanced precariously between a well-traversed city sidewalk and a well-traveled city street, they can result in damaging or injurious consequences, which is why the city wants Benny to get a street use permit that would require carrying liability insurance, something beyond the reach of a homeless guy. So he's become a sort of outlaw artist, loved and hated, and not only because he points out by his very existence there on the streets of Fremont, that the rocks will always come tumbling down. Last week I posted about the rope ladder that one of the adults hung from the cross bar of our swing set. I wrote then about how I'd started by imagining non-specific hazard from this arrangement, at least during the time before actual children arrived on the scene, but because my laziness trumped my conservatism on that day, the kids figured out, through actual field-testing, that the dangers were no greater than those associated with a normal swing and without my, or any other adult's harping on it, took appropriate precautions. She was applying this principle, in this case, not to the children, but to the adults, who, like I nearly did if not for my laziness, too often allow our ability to imagine catastrophe to guide our interactions with kids. 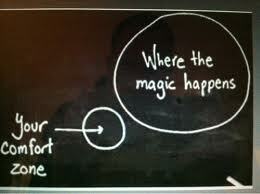 What I labeled "conservatism," is here depicted as the "comfort zone," a much better construct, I think. We tied a rope with a loop at the bottom to one end of our swing set. It occurs to me that this is perhaps the primary function of teachers in a progressive play-based environment: to continually expand our own comfort zones until they increasingly overlap that large, wonderful area where the magic happens. standing on them requires concentration as they tip and wobble under their weight. Children are already, naturally, drawn to where the magic happens. It's what the play instinct is all about. Not all of them are daredevils, of course, but it seems to me that this principle doesn't just apply to physical risk, but rather to anything worth doing. Human progress is really the story of stepping outside of our comfort zones and since education is a story of progress, teaching requires an ongoing and conscious effort to knock down the "brick walls . . . with nary a window" that Aunt Annie warns about and step outside. so you have to take care to leave it standing when you launch yourself. I've documented here and here, about how our preschool community (and by that I mean the parent part of the community) has made an uneasy peace with the concrete slopes that came with our new outdoor classroom. At this time last year, our larger concrete slope was closed to the children, covered with a tarp and surrounded with caution cones. Today, the older children race up and down the slope, hang from the lilac branches at the top, and construct "cabins" up in there. The younger children test their skills, making forays as their abilities allow, stepping outside their comfort zones, while the adults say things like, "If you can't get up there you aren't quite ready to be up there," instead of "be careful" or "watch out!" It's in the nature of adult comfort zones to contract if we're not continually conscious of stretching them out; if we're not in the habit of questioning our assumptions about children and about ourselves. It's not an easy thing in our risk-averse society for teachers to get out of our heads about risk, to set aside our catastrophic imaginings, and deal instead with the reality of the risk-taking that comes naturally to young children. About this time last year, just as we were moving to the Center of the Universe, I rescued a youth-sized drum kit as it was going into a dumpster. We gave it a place of honor in the bullseye of our new outdoor classroom, purchased 8 real drumsticks, and started banging away. I kept the sticks up high enough, I thought, tucked into the back of the windmill, that the kids would only get their hands on them with an adult's help, but within a month or so, they all, even the 2-year-olds, not only knew where they were kept, but had figured out how to get them down whenever they wanted. Over the course of the next several months, the drum sticks began to disappear, one-by-one, buried, I suspect, in the sand pit or perhaps dropped into a crack between logs or maybe even tossed over the back fence into the blackberries, but we kept on drumming with the few we had left. A couple of the kids drummed so enthusiastically that they'd torn through the plastic drum heads -- in fact, I don't think there was a single drum that didn't have at least one side torn through, but we kept on drumming. Marcus had carefully dismantled the high hat then promptly lost the little parts, but we kept on drumming. The weather was taking its toll. We'd never expected the drum set to last forever, of course, given that it certainly hadn't been manufactured with a Pacific Northwest climate in mind, but we kept on drumming. In the beginning people asked me, "Aren't you worried about it getting stolen?" No, I answered, not really. Easy come easy go. It came from a dumpster and its destiny was a dumpster. Besides, I have other plans for that spot. Early on a neighbor complained, saying that she worked a night shift and the drums were waking her. We agreed to not play the drum until after 10 a.m., but shamefully, we didn't really uphold our end of the bargain as a few of the kids really didn't feel like their day had begun until they'd laid down a solo. And then one day, early this spring, it was gone. I'd seen it on a Sunday evening, our tattered and battered and weather-warped drum kit, then not on Monday. Bummer. Kids stood in disbelief, staring at the empty platform where it had once lived, "Where are the drums?" Gone. A few asked if they'd been stolen and I answered, "Maybe so." I held out hope for a few days that it would return. A group of parents had been working on the outdoor classroom during our spring break and I wondered if maybe one of them had decided to take it home for repairs or cleaning: it's the kind of community we are. But by the end of that first week, the reality had sunk in for all of us. The kids moved on, more accepting of the loss than the adults, who continued to speculate about where it had gone, the leading theory being that some teenagers had commandeered them as a kind of hijinks, but close behind that was the idea that a neighbor (not necessarily the one who had complained) had had enough and helped our drum kit to an early demise. lid cymbal and a sauce pan lid drum head, along with natural stick drum sticks. A few weeks ago, R. told me, "We're making new drums for the school." We still had our Thunder Drum, of course, an overturned galvanized steel trash can, so I assumed he was somehow talking about that. "Great! We need new drums." "That's because the old ones got stolen." A few days later, he said, "The new drums are almost ready." And then it arrived, built to be hit as hard as you want, painted against our rain forest climate, designed to be awkward to steal. R.'s family had taken it on unbidden. We're down to 3 store-bought drumsticks, but we made many more by breaking sticks to the right length because everyone wanted to play. Between the first and second week of Woodland Park's first summer session we received a box of what are described by the manufacturer as "open-ended play costumes" from the Icelandic company Fafu Toys. I'll admit to have been eagerly awaiting the arrival of these "toys"; they look both magical and well-made on the website and I couldn't wait to put them through their paces. We're an outdoor school during the summer, rain or shine, and last week started off quite wet. I've noticed that almost all of the photography on Fafu's website shows the products being used outdoors, so I'm assuming they're designed for rugged use, but I decided, in fairness, since they're made from felted wool, cotton, and silk, to wait for drier days for their maiden voyage, although I still fully intend to eventually find out what happens with these toys after some good solid rain play. I displayed them on a funky coat rack near our garden, giving the parent-teacher in charge of the garden the basic instruction to just re-hang things when the kids aren't using them any longer, so they're easy to find, but to otherwise let the kids use the toys as they would. Charlotte arrived early, and being a child who has been coming here for a long time, saw something new, and made a beeline for them, "What are these?" "They're costumes." She then began to systematically remove items from the rack and drop them on the ground. "Aren't you going to try any of them on?" I was sitting in the sandpit while she dismantled my display. When she was done checking the inventory she came over to me and asked, "What are you doing, Teacher Tom?" I'd been fiddling around with a couple pieces of colored plastic tile. I stuck them in the ground and said, "I'm building a house." "I'll help you." So we set about collecting rocks, pieces of bark, some scraps of wood, and a few seashells. Liam joined us and we were soon engaged in a "Little World" style building project, that grew to include "a forest," a "backyard," and a "swimming pool." At one point Charlotte said, "I know!" She went back to the costumes, which an adult had carefully returned to the rack, picked out a purple "Cony", which she had clearly recalled, and added it to the construction, supporting it by inserting a stick through the hole in the point and into the sand, saying, "This is the tower." It pleases me that the first thing we did with our new toy was to use it as a loose part, an element of construction, as we played a story, sticking a feather into it for good measure. As the construction grew, someone reflected on the cone shape of our "tower" and incorporated a couple more cone shapes. As the loose part play took on a life of its own, I made myself scarce, which is what I try to do once things get going. A half and hour later, when I thought to check in, all of this was gone, the parts re-purposed for more timely endeavors. I tried to make no big deal of the new toys, wanting the kids to discover and explore them in their own way at their own pace, although it was hard given that nearly every parent who arrived with her child took a moment to enthuse over them, remarking particularly over the thick felted wool items. I tried to avoid the use of the word "costume," opting for the less limiting word "toys," but like Charlotte, most of the kids saw them as things to wear. Ah, but what kind of costumes? The "Handys" were alternatively animal paws, monster hands, and dinosaur feet. Some of the kids didn't like how the mitts limited the use of their fingers and discarded them fairly quickly, but others seemed to enjoy exploring things without the use of their fine motor control, trying things like climbing and drumming. The kids didn't really know what to make of the hat-like items, like the Coneys and "Earys". Oh, they knew they were hats, but what kind of hat? I slipped up at one point and suggested that maybe they were princess hats, only to be shot down: "Princess hats are pink!" A couple kids experimented with the triangular shaped "Silkys" (made from real silk! ), asking me to tie them around their waists so they could "match." The cotton "Poppys" were identified by most of the kids as capes. I like the way they have dozens of snaps sewn around the edges, however, which should allow kids to explore using them in a variety of ways as they get to know the toys better. I can imagine sleeves and skirts being "made" from these. So far, the kids have asked adults to work the snaps. Ultimately, we're going to want the kids to be doing that on their own, I think, if we're going to really unlocked the potential of these toys. We definitely need to add a large mirror to our outdoor classroom, something I've wanted to do for awhile, but until now I've not felt strongly compelled. There's nothing that promotes dress-up play more than being able to see yourself in costume. The one item that didn't get used during these first few days were the "Andys", circular poncho-like pieces with lots of holes for arms and legs. I don't think we've done anything so far more than scratch the surface with these toys. My plan is to let them "run" out there in the outdoor classroom all summer. It will be an ever-changing group of children of all ages, but a core group will be there all summer, which should give them an opportunity to really put them through their paces and figure out what they really are. (This is more "inside baseball" than I usually like to get into around here, but hardly a day goes by that I'm not approached by someone who wants to use this blog to help them "get the word out" about a product or service or website, most of which are likely wonderful, worthy, and wow. Sometimes they're inquiring about advertising rates, sometimes it's a quid pro quo kind of offer like a trade of links, sometimes it's free stuff to use for my own site's marketing efforts like give-aways, and some of it's a straight forward publicity pitch. I spent years working in public relations, advertising and marketing before finding my calling, so believe me, I do sympathize, especially with small business operators who are working on a shoestring, but mostly I decline. When I started writing here 3 years ago, I did so under the assumption, even expectation, that one day I'd have enough readers that Teacher Tom's Blog would be an attractive place to advertise. I even have a page all written up and in draft form that I prepared 2 years ago against the day when I launch official efforts to sell advertising. For awhile I rented out a tiny portion of the page to a major advertising network, but even though I checked all the boxes I could, I was still regularly appalled at the ads I would find here, so I discontinued that. I still want to run ads some day, but the longer I've been doing this, the more uncomfortable I get with the idea of product advertising for things that I myself can't endorse. I hope, if nothing else, part of the "Teacher Tom brand" is honesty and integrity, and if I'm going to attach my name to something, I want it to be something that will not only not damage that brand, but will be something about which I believe readers will be happy to learn. I don't send my child to school in order that she will one day be successful. I don't even necessarily send her to school so that she will be successful today. I certainly enjoy it, as a father does, when she is successful: those times she comes to me and says, "I'm proud of what I did," the only success that's worth a damn. But that isn't why I drove her to school on that very first day or nor why she puts herself on the bus each morning these days. I've changed my mind about a lot of things during my 15 years as a parent -- in fact, I've changed my mind about most things I thought I knew about being a parent before I was one -- but this is a feeling that has only grown. The idea of schools and their lessons that must be learnt by this day or that, their desks and walls and textbooks and grades and lectures and homework, their perverse insistence upon giving the tests at the back end of lessons instead of, as experience, the greatest teacher of all does it, by giving the test first and the lesson after, this all caused my insides to clench up, although I didn't have the knowledge then to put it into words. All I knew is that I didn't at all like the idea of my child spending the first couple decades of her life jumping through hoops for judges who would then tell her whether or not she ought to be proud. It has always been enough for me that she wants to keep going back. Education, of course, needn't come from schools and I knew it even then. I thought a lot a decade ago about homeschooling or unschooling or spending a few years as a family sailing around the world, all best laid plans for a theoretical daughter. As I got to know the real person who is our daughter, however, I began to see that she was like her mother in that she genuinely craved the other people, that a small social world wouldn't hold her contentedly for very long, that she would very soon outgrow any and every clique I was able to manufacture for her, that her passion for connecting with them would always grow bigger than every social life I attempted to cobble together. She would want, I perceived, especially as she grew older, a larger universe of people in her life than I was constitutionally capable of sustaining. Schools were where most of the kids could be found and I knew by the time she was ready that school was the right place for her. We chose school over the other educational options for social reasons, because that was what she most loved. For a decade now, I've arrived at parent-teacher conferences with only one two-part question: Does she treat her classmates well and do they treat her well? Beyond that, I let her teachers tell me what they want to tell me about how they see her strengths and weaknesses, valuable data points for a parent who still must make a few decisions on her behalf and who no longer spends most of his days in her company. But more valuable is the subsequent discussion I get to have with her about those judgments, some of which she agrees with, some she rejects, and others she takes under advisement. I'm always impressed by her ability to analyze her teachers assessments, minimizing both praise and criticism when she feels they are undeserved or off target, talking of steps she has already taken or will take when what she hears strikes her as true. This is her passion, not the grades and tests, but the figuring out of people, learning from them, and building a life that is full of them. There have been times over the years when we've been tempted to use this passion as a kind of cudgel the way Tiger Mom types do; to ground her, to make her drop her after school Shakespeare group, to take away her guitar, until she can "better focus" on something for which she has no passion at all. But the few times we've tried this it's been very short-lived because it made us both feel as if we were cutting off her oxygen. Relationships, acting, music, these are the things that she loves: these are the things in which she excels because of that love. These are the reasons she wants to keep going back. 8) All kids can learn, and its companion, All means all . . . These phrases are used to impose a one size fits all curriculum. Learn what? At what rate? Yes, all kids can learn. But they possess different aptitudes and they learn at different rates. That kid writes beautifully and is a tremendous musician, but he struggles with math. Tough! Into Algebra II with him. And if he still struggles, take him out of band and put him in math remediation class too. No excuses! All means all! . . . Perhaps I should try this philosophy as a track coach. I will take my champion shot putter and force her to become a distance runner. And if she doesn't run under 13 minutes for the 3200, she won't be able to compete in the throws . . . It has always been enough that she wants to keep going back. The teachers who have opened our daughter's eyes to new passions -- to literature, to science, to math, to history, to sports, to language, to politics -- have been the ones who knew to do it through her foremost passions for creating relationships, acting, and music. They are the ones who have succeeded in helping her find new passions or to discover her bedrock passions in new and surprising places. She came to love volleyball in middle school because her coach understood that being a teammate was far more important than winning, losing, or even athletics themselves. She came to love the poetry of Robert Browning because her teacher was able to show her the music embedded in his verse. She came to an appreciation for (I won't quite say love) for Biology when her teacher stepped out the rigidity of subject matter to lay down some straight-forward older sister style truth about teenage life. She became passionate about politics when her teacher pulled their heads out of text books and got them up in front of the room, on a stage, to actually debate the issues. And, of course, her music and drama teachers just keep setting up challenges and next steps for her, trusting that her passion will teach her what she needs to learn, building relationships with her, and fully understanding that their primary job is to keep her wanting to come back. I don't send my child to school in order that one day she'll be successful, because in the most real sense of all, she already is. She has found things she loves, she keeps finding them at school, and her teachers are discovering how to use her passion to open up more and more of the world to her. That's why she keeps going back.